I had been eating kind of heavy meals over the last few days and I was feeling like something lighter and healthier. I remembered seeing a cauliflower and chickpea curry at a restaurant that I thought looked good and I wanted to try making it at home. With the main ingredients of cauliflower and chickpeas this curry sounded like it would fit both the light and healthy bills. I also wanted to fit a green vegetable into the curry and since fresh green beans are still available I decided to add some. I enjoy the chewy texture of brown rice and given that it is also the healthier option I thought that it would make the perfect bed to soak up the extra curry sauce. This curry is really easy to make and it takes very little effort or time so it is perfect for week nights. Given that the curry powder is the primary source of flavour you are going to want to use a tasty one and I used my favorite. The cauliflower and chickpea curry turned out really well. It was nice and tasty and light and yet still filling. I packed the leftovers up into individual servings and I have been bringing them to work for lunches this week. The leftover reheat well in a microwave and they have only been tasting better with age. Add the onion and curry powder and cook until the onion is tender, about 5-7 minutes. Add the tomatoes, chili sauce, cauliflower, chickpeas and water and and bring to a boil. Reduce the heat and simmer, covered, until the cauliflower is tender, about 10-15 minutes. Add the green beans and cook until they are just tender and still crisp, about 3-5 minutes. Serve on brown rice and garnish with cilantro. Oh wow, definitely love it! I would just love this for dinner, but nobody else in my family would eat it. Poor me. This looks flavorful and delish! Cauliflower and chickpeas are two of my favorites. I’ll definitely be making this! Oh that looks awesome! My currys never taste quite right….I have some work in that dept left to go! Great dish! Love cauliflower. Love curry. Love this! Just the look of it made me hungry! Great recipe! Kevin, every time I visit I am bowled over by your creations and presentations. This is one of my favorite kinds of meals. And I agree, it gets better with age! Is it spicy? It looks fantastic and would fit in with the whole “eating healthier” intention I have (maybe only parts of the week, lol). Simple, delicious, nutritious. I love curry! Yeah, this is a nice dish,I like to add a scoop of plain yogurt right on top. Your brown rice looks so whie though! I love both ingredients, so that curry would please me! Delicious looking! Yum – Great picture Kevin and I love the recipe! I bet the curry really brings a ton of flavor to the cauliflower. What a great meal. Btw I have tried out your Waldorf Salad and it was great. I have posted it up and linked you. Thanks for sharing so many wonderful recipes. You could use stock – chicken or veg – instead of water to boost the flavour. those are fantastic pictures. the colors are great. I’ve never paired cauliflower and chickpeas before, but it sounds like a great combination! Looks very good. i cook cauliflower atleast once a week:-) yours is a nice combo of veggie & protein.. if tagine excites u, u should try cauliflower tagine! the morrocan spices impart awesome flavor to cauliflowers. Oh my goodness, it looks like chicken! I’ve been trying to find more ways to serve cauliflower. I’m gonna have to try this one! This sounds like a great meal and perfect for leftover lunches! love the colors, fabulous dish!! beautiful colors, i love how the cauliflower turned such a bright orange. looks delicious! Great color. Love curry dishes! I love that your dishes are all so varied and unique! You definitely inspire me. Your pictures are always so gorgeous, too- what kind of camera do you use and do you have any photography experience? Beautiful, delicious! Your dishes always look favorful. I’ve seen orange cauliflower at the store (LOL) but your dish is definitely the winner. Even though I don’t like cauliflower. Yum – healthy but still really flavorful! I like your addition of green beans too! That looks great!! I’m looking for something a little lighter too! Looks delicious Kevin…love the color of the curry…could have this anytime. We really love curries and stir fries with brown basmati rice. It’s really light too. This curry recipe would be a mighty fine accompaniment! Oh, a curry dish with chickpeas! Just perfect. I love the colour. Such a healthy dish too. Yet another home run sir! I really love that this recipe relies on such simple, inexpensive ingredients. It looks like the perfect weeknight dinner — and very budget friendly to boot! I made a cauliflower & chickpea curry last month. Yours looks much brighter than mine did. What brand of curry powder did you use? My recipe called for a combination of spices instead of curry powder, but this looks like an easy weeknight option. What kind of curry powder do you use? I have not found one that I love… Thanks! Love your site and gorgeous pictures. Thank you for this! I had a similar meal at a food festival in Vienna. I’ve tried to recreate it, but can’t get it quite right. I can’t wait to put this recipe to the test. Great color in this dish and the flavor must be terrific! It’s wonderful that you try so many different things. Even when it’s something I wouldn’t want, I love to read your directions and contemplate your dishes! Michelle C: You can cut down on or omit the chili sauce as you like. The only other thing adding spice to this dish is the curry powder. So if you use a mild curry powder the curry will be nice mild as well. Soma: I do like the sound of a cauliflower tagine. Kimberlita & Natalie: I used S&B Oriental Curry Powder. It has an aroma just like my favorite Japanese curry. This is my kind of curry Kevin, well my kind of food altogether really. So what is your favourite kind of curry powder? Wonderful flavors Kevin. I can’t wait to try this! I love how veggie-ful and flavorful this dish is. Right up my alley! What a gorgeous curry, Kevin, look at the color 🙂 yums! I bought all the ingredients to make a vegetable curry yesterday without having a recipe. Thanks for providing one that seems to be exactly what I was thinking about! I love curry, and you’re right, the flavors are even better the following day. I have never made a veggie curry before, but this looks well worth a try. Thats very vibrant pic Kevin. Great capture! Looks so yummy Kevin! Looks easy with the curry powder. great recipe. I didn’t have any green beans so i substituted with silverbeet. Also i used a mix of garam masala, turmeric and coriander seeds as i didn’t have any other curry powder. Just made this and it was great! A few modifications that I thought I would post, as I was short on some ingredients…I was running low on curry so I used 1 Tbsp of curry and 1 tsp each of ground cumin, coriander and turmeric, and I didn't have green beans so I substituted with some chopped kale. The end result was awesome though! I may cut down on the water next time, though, as I like a thicker consistency. Thanks for the recipe….your blog is gorgeous and mighty impressive! Kevin, what kind of chili sauce do you suggest? Meghan: I normally use a simple sambal oelek which has a nice heat to it. Great recipe 🙂 I used a "kerrie masala" mixture and cayenne pepper instead of the chili sauce. Added some vegetable stock in place of salt. Had half a can of cannellini beans, so used those and not chickpeas. It looks heavenly! I love cauliflower and I eat it very often but I have never seen it in such version, combined with curry. I will try this recipe next time I prepare cauliflower. 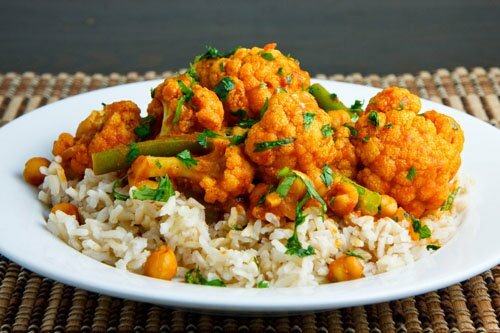 I am Indian, but never had chickpeas with cauliflower. Green peas, yes! Try cauliflowers with some shrimps. They taste awesome. What an awesome recipe! I made this today and served it over brown rice alongside with a little bit of yogurt and some of the mango chutney from your other recipe (which is great too!) Will definitely be made again!!! I stumbled across your blog by accident and boy am I happy! I just got a beautiful head of cauliflower and will try this recipe tomorrow. Can't wait. by posting so many delicious broccoli recipes. Which one to choose? Living in India I now will go to my kitchen (in this dreadful heat) and cook the curried one. Thanks anyway – love your blog photos, as always. The Indians have a lovely side dish of cauliflower and potatoes in a sauce but I've forgotten what it's called. I could phone my sister but it's 00.41am. I don't think she'd be very happy.